Yaderlin Hiraldo Jimenez, the wife of missing Army Spec. Alex Jimenez, no longer has to worry about being deported as she awaits word of her husband's fate. On Friday, Yaderlin walked into a US Citizenship and Naturalization Services Office in Buffalo, New York. She left with a greed card in her hand, guaranteeing she can stay in the U.S. for the rest of her life. "Her immigration problems have been solved in their entirety and now her focus is completely dedicated to her hope and desire that she's going to see her husband again," Kolken added. The move came after U.S. Department of Homeland Security Secretary Michael Chertoff said last month that his agency would "terminate" the deportation case against Yaderlin so she could stay in the country and apply for permanent resident status. At the time, Chertoff said in a letter to Sen. John Kerry, D-Mass., that "the sacrifices made by our soldiers and their families deserve our greatest respect." Jimenez, of Lawrence, Mass., and a comrade, Pvt. 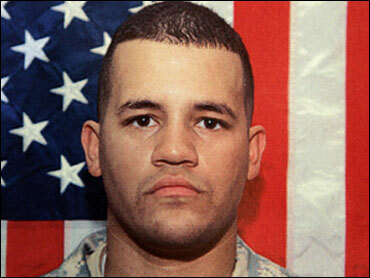 Byron Fouty, 19, of Waterford, Mich. have been missing since their unit was attacked by insurgents in Iraq on May 12. Jimenez had petitioned for a green card for his wife, whom he married in 2004. Yaderlin illegally entered the United States from the Dominican Republic in June 2001, paying $500 to a smuggler and walking three days from Mexico to California. Her husband's request for a green card and legal residence status for her alerted authorities to her situation. On Friday, the Pentagon changed the status of Jimenez and Fouty from "whereabouts unknown" to "missing/captured." The change reflects an official determination that the two were seized by hostile forces. The earlier designation is typically used when a soldier goes missing but military officials have not confirmed the circumstances. The change does not mean the military has gained any new information about their whereabouts. Kolken said Yaderlin hopes to apply for citizenship so she can eventually vote. She also hopes to attend college, he said. "She commented about how much she loved this country," Kolken said.